You may hear the word “cholinergic” tossed around quite frequently on this blog and others. This is because the word cholinergic often involves nootropics. Cholinergic means the acetylcholine-producing system. This is the system that manages and creates acetylcholine however the word often refers to anything involving acetylcholine. Acetylcholine was the first neurotransmitter discovered. It plays a number of roles within the body and throughout the different systems. It is vastly important in maintaining heart rate and moving muscles. These are just some of the important methods acetylcholine carries. Acetylcholine is also important in cognitive functioning. It plays a prominent role in decision-making and learning as well as memory. Acetylcholine is also very important in sensory perception and this is the reason why many people taking racetam nootropics may have an enhancement in the vividness of colors (a commonly reported effect when first starting racetams). 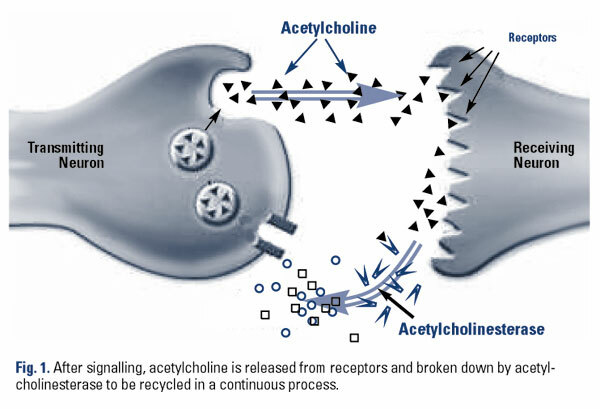 The cholinergic system is important because it helps to create and manage acetylcholine. Acetylcholine is derived and synthesized from the natural compound, choline. There are many factors in determining if choline will be synthesized into acetylcholine. If the cholinergic system is damaged, it may have trouble creating acetylcholine or getting a successful reaction from the receptors. This is thought to be in part, what causes or causes the degradation in Alzheimer’s disease. There are many types of cholinergic nootropics. Technically, cholinergic nootropics would only involve nootropics involved in the synthesis of acetylcholine. For simplicity, any nootropic involving acetylcholine is referred to as cholinergic. Examples of cholinergic are: acetylcholine precursors, positive allosteric modulators and acetylcholinesterase inhibitors. 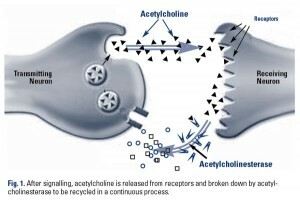 Acetylcholine precursors are considered true cholinergic nootropics because they help to produce acetylcholine. Choline itself is an acetylcholine precursor but not a nootropic because it does not produce noticeable enhancements to cognitive functioning (unless the individual is deficient). Two common acetylcholine producing nootropics are alpha GPC and citicoline. These two work in different ways to create higher levels of acetylcholine. One of them breaks down into acetylcholine whereas the other acts and an intermediate in the production of acetylcholine. Alpha GPC and citicoline both have nootropic benefits. A positive allosteric modulator is any substance that amplifies a signal at a receptor. In the case of cholinergic positive allosteric modulators, we are primarily referring to racetam nootropics. Racetam nootropics act to amplify the signal of acetylcholine receptors. This is a primary nootropic action of these substances. The reason racetam nootropics do not get their own category is because many act as ampakines as well. Acetylcholinesterase is an enzyme that breaks down acetylcholine. The enzyme is important for life by terminating muscle movements and contractions. Having too much acetylcholinesterase can be negative for cognition. This is where acetylcholinesterase inhibitors come into play. There are two groups of acetylcholinesterase inhibitors: reversible and irreversible. Reversible are the only types that can used as nootropics because irreversible inhibits are toxic. Many toxins and chemical weapons like nerve gas are irreversible acetylcholinesterase inhibitors. On the other hand, reversible inhibitors like galantamine and huperzine A are reversible and great nootropics. Many people will choose to create a cholinergic stack. Most nootropic stacks involve cholinergic nootropics somehow as these are a primary type aside from glutamatergic and dopaminergic nootropics. Choosing a combination of cholinergic nootropics may create a synergy that amplifies the effects of the others. This is why many people will combine a cholinergic racetam(s) with a choline source or acetylcholinesterase inhibitor. The cholinergic racetam acts as a positive allosteric modulator at the acetylcholine receptor therefore creating a demand of choline within the brain. Combining the choline with the racetam may help to potentiate the nootropic benefits or reduce possible side effects due to cholinergic deficiency.